Company's innovative WiFi@Sea™ high-speed network will combine land-based systems and advanced satellite connectivity designed to give passengers faster, more stable and powerful internet service at sea. With connectivity speeds that can be roughly 10 times faster than ever before, passengers will be able to share their cruise experience via Internet, email and social media in real time. 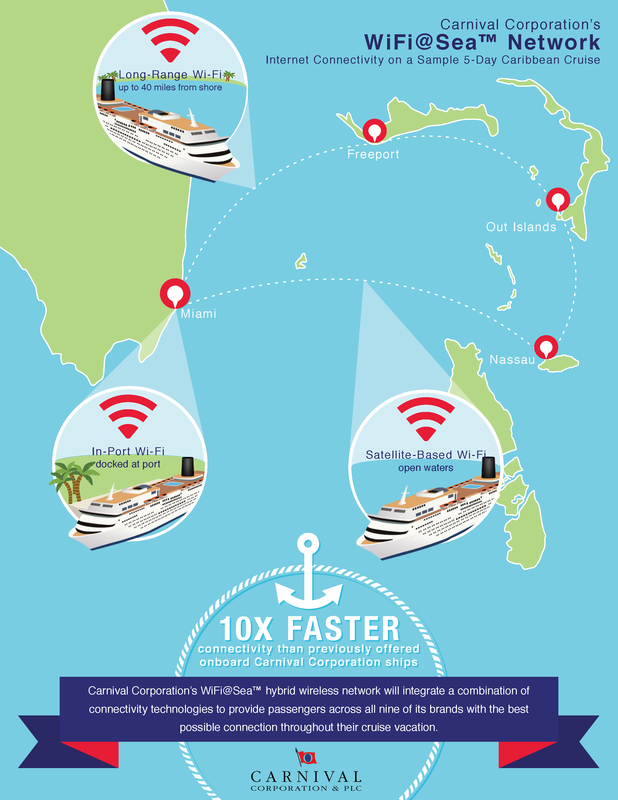 MIAMI, Nov. 3, 2014 /PRNewswire/ -- Carnival Corporation & plc (NYSE/LSE: CCL; NYSE: CUK), the world's largest cruise company, today unveiled the cruise industry's first-of-its-kind hybrid wireless network – an enhanced high-speed service to eventually be rolled out to all 101 of its ships on all nine of its brands. This technology innovation is expected to revolutionize how millions of its passengers stay in touch during their cruise and generate even greater interest in cruise vacations, especially among the tech-savvy millennial generation.